That’s the increasingly confident forecast from the U.S. Climate Prediction Center. In its latest monthly report, the CPC continued an El Niño watch and boosted the odds of it developing during the Northern Hemisphere winter of 2018-2019 to 70 percent. Last month, the center pegged El Niño’s chances at 65 percent. This is important because El Niño has profound impacts on weather around the world. Here in the United States, El Niño tends to result in an amplified winter storm track across the southern tier of the country. This usually brings wetter conditions — including to southern California and portions of Nevada and Arizona, areas now afflicted by severe drought. Click on this map to see typical winter weather impacts during El Niño episodes. The atmosphere is an incredibly complex and chaotic system. So we shouldn’t expect to see all of the impacts shown in the map — which is about probabilities, not certainties. But more than half of all El Niño events since 1950 have brought wetter than average conditions to California. What has happened to cause forecasters to feel more confident that an El Niño will develop? 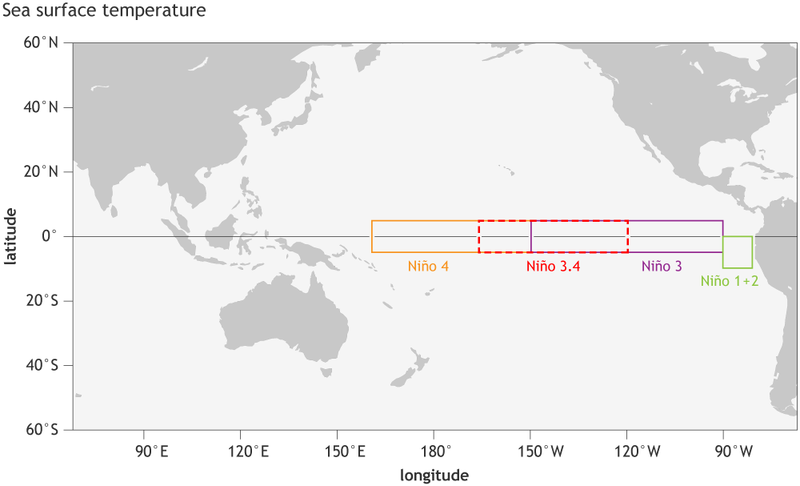 The climatic phenomenon is characterized by a number of changes in the tropical Pacific region, most especially warmer than average sea surface temperatures in a swath along the equator known as the Niño 3.4 region. And, in fact, temperatures along the equator have been edging up, as the map at the top of this post shows. If the models and forecasters are right and El Niño does develop, we should expect one other impact that I’m sure would be an unpleasant prospect for the millions of Americans who have been sweltering in recent weeks: a boost in global temperatures. This would come on top of the rise in temperatures from human-caused global warming. Thanks in part to a boost from a particularly strong El Niño in 2016, that year obliterated the record for warmest year. Thank goodness there are no indications now that we’re heading for an El Niño that strong. Forecasters are actually expecting it to be in the weak to moderate range. Let’s hope that will mean only a modest boost to global temperatures — but a nice influx of desperately needed moisture to drought afflicted areas.